Daylight Power Company, LLC - Solar electric integrators - designing, installing and servicing solar panel arrays in Pennsylvania. A solar electric system is a safer investment in today's world - a tangible investment which will pay you back 3 fold or more! Please call or email for a free quote, consult or to request a brochure. 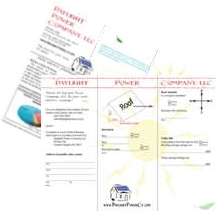 The "My Solar Estimator" link below will give you a rough idea of your solar electric needs and prices. Please contact us for a real quote.